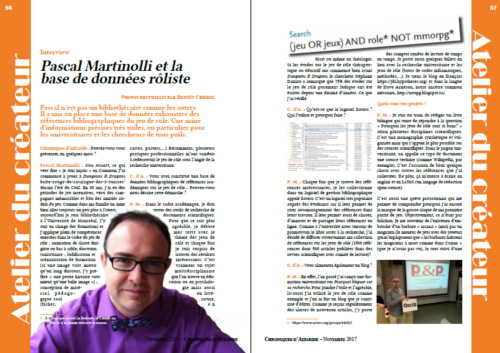 Benoît Chérel, editor of the Chroniques d'Altarides, invited me for an interview in his open access TRPG magazine. I talk about my role-playing gamer past, and also about my current academic projects on TRPG : teachings, databases, this blog, graphs, publications, etc. You can download the issue no. 42, or read it online, or order a paper copy.